I think that this little tube of magic is rather versatile. Applying a small amount does add a slight hint of shine, but when you apply more the lips look super glossy. It's fairly long-wearing as a balm and as a gloss it lasts around a couple of hours which is pretty standard. It's also great over lipstick, so you can mix up your look as and when you want. One thing to keep in mind though is that this Lip Moisturizer is quite thick. Because of that, I can imagine a lot of people preferring to use this before bed as it can feel a bit heavy on the lips. Whenever you choose to use it, it leaves the lips feeling soft and smooth. If you use it before bed, your dry lips will be miles better upon awakening. If you use daily, you will see some great improvements rather quickly, but for best results keep using for around a week. You don't need to just use this if you are suffering from dry lips though. I find that this balm is great at preventing the problem from occurring too, so it's always handy to have in your handbag. This is one of those products that is great in the summer as it is perfect for a low-maintenance look whilst looking after your lips. In the winter is probably the best time to wear it over lipstick as it can be quite heavy, as I said above. When worn over lipstick it may be simply too heavy for a hot day. The only real downside for me is that I find a lot of product comes out of the tube when you try to use it. This is more of an issue when you only want to use a small amount and don't want a glossy finish, but you can still get too much for a glossy look too making it feel like a waste of product at times. Overall though, this is a fab little moisturiser that is well worth a try if you are suffering from dry lips. You can use it as a balm, a gloss or over lipstick to mix up your look as you take care of your skin, so it definitely gets a recommendation from me. You can purchase the Malin + Goetz Lip Moisturizer from Space.NK. 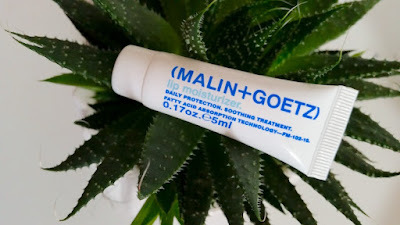 What are your thoughts on the Malin + Goetz Lip Moisturizer? Which lip balm is your favourite? I got this free with a magazine a while ago and absolutely love it! I love the glossy yet non sticky formula - it makes your lips look so plump! I also like the fact it doesn't have a scent because most scented lip products make my throat itch (weird right haha). fab review!